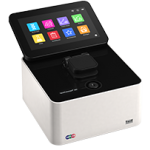 The power and precision of standard spectroscopy and microvolume combined with the convenience of a lightweight portable instrument with a built-in 7" inch LCD glove compatible touchscreen and flexible unit control options. Built-in vortex provides sample uniformity for the highest degree of accuracy with the smallest sample volume with as little as 0.3µl. Illuminated quartz sample surface allows for easy sample application.